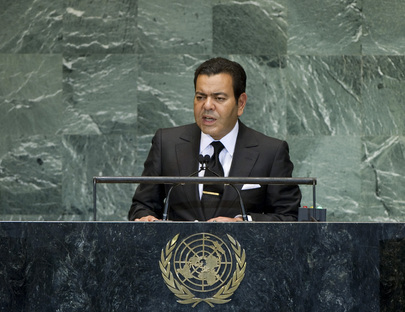 MOULAY RACHID, Crown Prince of Morocco, said his country took pride in having been one of the first States to contribute to United Nations peacekeeping operations, noting that to date Morocco had sent more than 50,000 members of its Royal Armed Forces around the world. Expressing deep concern over the deteriorating situation caused by criminal, terrorist and separatist activism in Africa, particularly in the Sahel and Sahara regions, he reiterated his country’s commitment to continue providing the people of Mali with aid and supporting the political process there. On the other hand, he commended the notable progress made towards national reconciliation and political normality in several parts of Africa, especially Côte d’Ivoire and the Democratic Republic of the Congo. Morocco would remain firmly committed to pursuing cooperation and solidarity programmes with various African nations, he added. On the Arab region, he said the changes witnessed there reflected the popular will to build democratic societies in which human rights would be respected, and citizens would enjoy equal opportunities and dignified lives. “The people of Tunisia, Libya, Egypt and Yemen ushered in a new era and have made much headway towards democratic transition, despite a complex and troubled political environment”, he said, urging the international community to provide support and assistance to those countries. Troubled by the ongoing violence in Syria, he said that as the only Arab country on the Security Council, Morocco had contributed significantly to the mobilization of international support for Arab League initiatives and resolutions, and had called for concerted and decisive action to compel the Syrian regime to end the violence. To help refugees and internally displaced persons while easing the suffering of all Syrians, Morocco continued to provide medical services to refugees in Jordan every day, he added. He said his country had undertaken initiatives and bilateral contacts to address the security and development challenges facing the five member States of the Arab Maghreb Union. Morocco had contributed in a sincere, dedicated manner to negotiations for a realistic and mutually acceptable political solution to the “regional artificial dispute” over the Moroccan Sahara — one that would guarantee the kingdom’s national unity and territorial integrity, allow reunification to take place and respect the characteristics of the region’s populations. Emphasizing Morocco’s commitment to negotiations based on the principles set by the Security Council, he said it would cooperate with the United Nations Mission for the Referendum in Western Sahara (MINURSO) on the basis of the mandate entrusted to it by the Council, which would not change in any way.